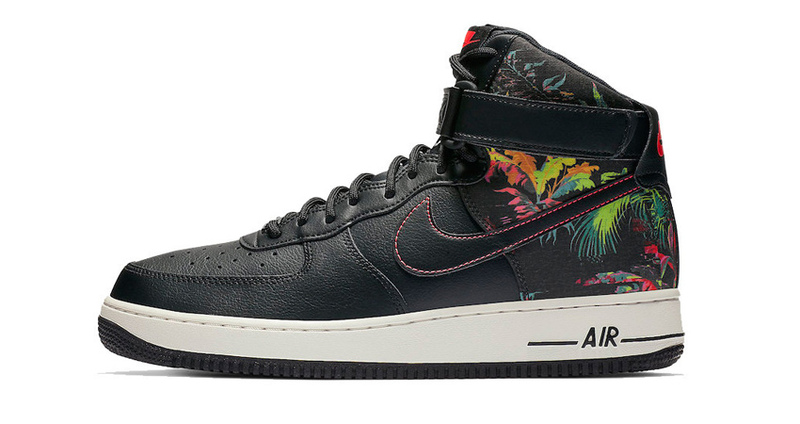 Nike Air Force 1 High Gets the Swoosh’s Floral Makeover, and it’s the wildest theme ever! It has the ultimate GNR vibe because of the mixture of pitch black and neon flower prints. This is not the first floral issue for the Swoosh kick. But it’s definitely not the usual one. Pitch black full grain leather upper is just as much robust as the flowery prints are soft! Nike Sportswear beasts are all getting a floral make-over for the All-Star weekend. This AF 1 bootie gets in line as well. You will seriously regret missing out on it! So, make sure you’ve got all the sneaker senses sharp. Hit us up on @FastSoleUK to get all the latest details and bits about the Air Force range. This flowery and wild colourway is all that a sneak freak could ask for this Fall. Leafy, colourful, and enthusiastic- all of these modes pop up from the basic black leather upper! It’s clearly party-ready because of the elegant and festive attitude. You can flaunt it with any outfit you like. The leather walls keep your steps light, comfy, and safe on any track and any season while the playful colours of the floral heel and collar contrast with the softness of mother nature! A white midsole and red brandings finally finish off the look.